Mexico Beach, Florida, is the ideal place for couples to reconnect. Peaceful and relaxed, the atmosphere in Mexico Beach encourages time spent strolling hand-in-hand along the shores of the Gulf of Mexico and reminiscing while dining on fresh seafood at one of the many local restaurants. Rekindle the spark and relive the passion that first drew you to one another under the breathtaking sunsets of Northwest Florida and say “I Do,” again during the 2017 Vow Renewal Ceremony! Whether you have been married one year or fifty, celebrate the memories of your life together in Northwest Florida. 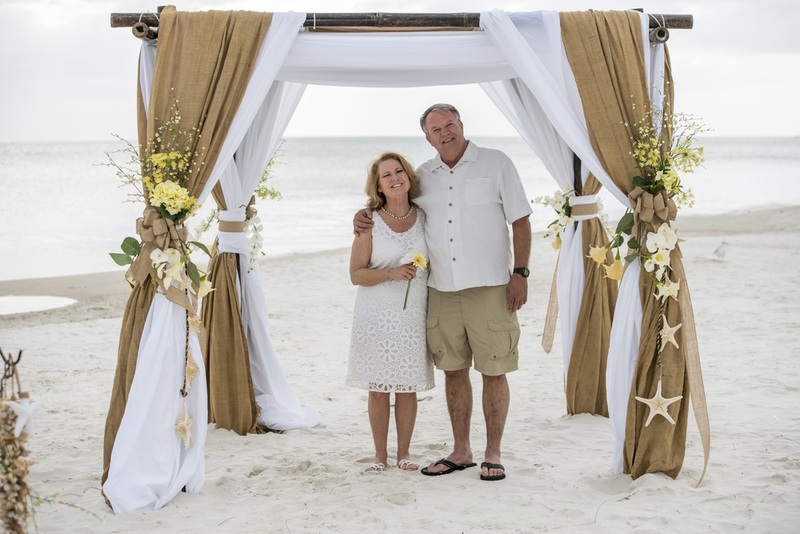 On April 8, 2017 at the Third Annual Mexico Beach Vow Renewal Ceremony, all married couples are invited to reaffirm their everlasting love on the beach near Sunset Park. Last year’s ceremony had nearly twenty couples participating, along with friends and family who came to enjoy the event and take in the gorgeous views of the Gulf. In the company of friends and family, walk down the aisle again with a breathtaking sunset over the Gulf of Mexico as your backdrop. Couples who tied the knot in Mexico Beach and those who said “I do” around the world are invited to celebrate together at this unforgettable event. A complimentary reception with refreshments, music, and dancing will follow for everyone to celebrate with friends and family. Couples interested in participating are asked to complete the registration form, which can be found here. This Valentine’s Day, show your love by booking a trip to Mexico Beach for this special ceremony! Be sure to book your stay at Mexico Beach for the 2017 Vow Renewal Ceremony early, as accommodations will fill up fast! Visit our Places to Stay page for a complete list of lodging partners. Whether you’re looking for a quaint seaside cottage for a relaxing, romantic weekend getaway, or a campground to bring you close to the diverse nature along the Gulf, Mexico Beach has a place for everyone. Among the Gulf-view rooms, condominiums, luxury vacation homes, cottages, and RV parks, Mexico Beach has locations suited for every couple, or the whole family. Book your vow renewal honeymoon today and experience the beautiful spring weather in Northwest Florida. Visit the rest of our website for ideas on things to do, day trip ideas, our official Mexico Beach Calendar of Events, and more to start planning your vacation today! We can’t wait to see you in Mexico Beach! MXB Wedding renewal from Mexico Beach FL on Vimeo.